We looked at the top 1 BBQ Grills and dug through the reviews from 3 of the most popular review sites including Consumer Reports, Derrick Riches, BestReviews and more. Through this analysis, we've determined the best BBQ Grill you should buy. A large grilling area and TRU Infrared technology set this model apart from other gas-powered grills. With TRU Infrared, you get fast warmup and even cooking, regardless of where you place items on the grilling surface. The price is slightly above other gas grills, but you're paying for the innovative technology. In our analysis of 47 expert reviews, the Char-Broil Char-Broil Signature TRU-Infrared Gas Grill placed 2nd when we looked at the top 7 products in the category. For the full ranking, see below. Checkout The Best BBQ Grill for a detailed review of all the top bbq grills. A well-made, midsize option that offers TRU Infrared technology for precise cooking temperatures. 200" swing-away warming rack and fold-down side shelves. Thin materials and limited construction quality. 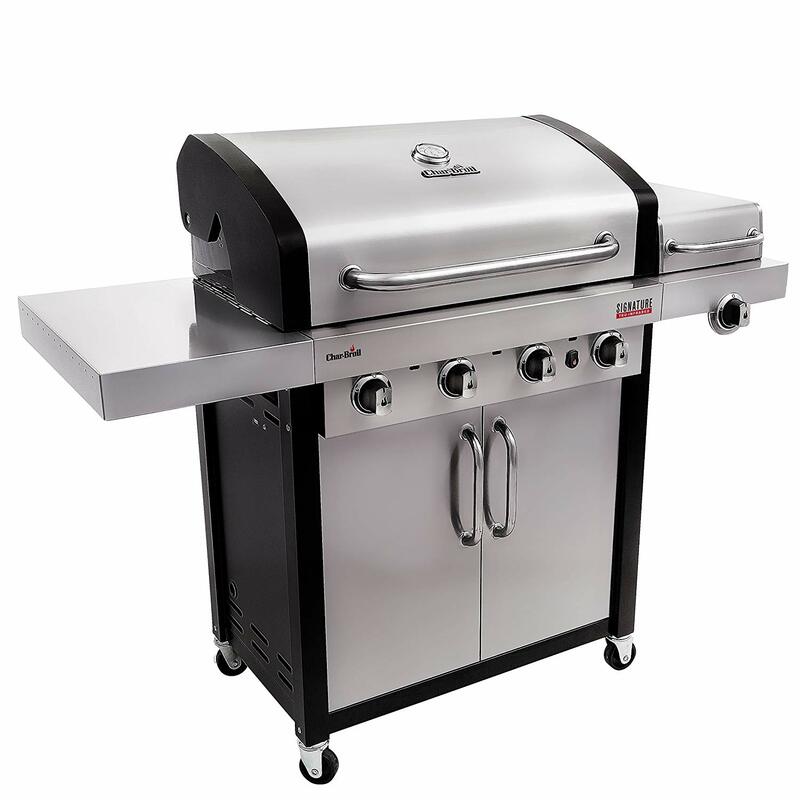 The Char-Broil Signature TRU-IR 4 Burner Cabinet 525 Gas Grill is the perfect way to cook mouthwatering burgers, juicy steaks, and smoked chicken for friends and family. With a primary cooking space of 525 square inches, this grill features four stainless steel tubes that yield 32,000 BTUs. The grill features a Surefire electronic ignition system, so all you need to do is push a button and start grilling. In many areas of the country, when the weather turns warm, the barbecue grills come out. Summertime is for backyard get-togethers where hamburgers and hot dogs are grilled up and handed out. Foods like steaks and chicken are never quite as good as they are when cooked on a good grill. But if you haven’t shopped for a new barbecue grill in a while, you may be surprised at the many options. You’ll still find plenty of gas-powered grills, but even they have improved. You can now find grills that use technology to ensure every inch of the grill is heated to the same temperature, eliminating the need to move food around to make sure everything cooks evenly. You’ll also find that some grills start with the push of a button and heat up quickly, which means you won’t have to stand around waiting for it to reach the right temperature. One newer type of grill that has become popular is the wood pellet grill. This adds a smoky flavor to your meat that you can’t quite get from charcoal or gas grills. This type of grill can be much more expensive, but for true foodies, the smoky taste is well worth it. These grills can act as a smoker, tackling foods like ribs and chicken, or cook more traditional grilled foods, like steaks and hamburgers. You also don’t have to wait for good weather to grill, thanks to the indoor units that are on the market today. These grills have expanded in recent years, growing in size and capabilities. You’ll also find that some indoor grills can be used outdoors, as well, coming with a special pedestal that can be removed when you bring it indoors. If you’ve ever tried to cook for a crowd on a grill, you probably know space can be at a premium. Now, there are grills on the market that keep that in mind, creating enough cooking space to squeeze in plenty of burgers, hot dogs, steaks or whatever else you want to cook. Some also come with side burners and warming areas that make it easier to keep multiple items going at the same time. Cleanup is also a factor with any grill you buy. Plenty of outdoor chefs have wasted valuable time scraping away melted on food particles. To avoid this, look for a grill that collects waste and food debris in a separate tray to keep your cooking surfaces as clear as possible. Affordability can also be a big differentiator. You’ll likely find that wood pellet grills are far more expensive than standard gas grills, which is understandable, considering their expanded functionality. Features like even heating and extra warmers may also drive up the price among standard grills, so if you notice one is more expensive than another, consider all of the extras you’ll be getting. On the far more affordable end are the indoor grills, which may not make food that tastes quite as good as what you’ll get with a gas grill or a wood pellet grill, but will have plenty of advantages in addition to low price. Wood pellet grills have long struggled to keep up with gas grill sales, but that may be gradually changing. Experts say it’s the fastest-growing segment, despite still comprising only 5 percent of overall grill sales. The technology has actually been around since the 1980s, but it took a while for them to hit the mainstream. Wood pellets are small, which allows it to burn more cleanly than other wood fragments would. They’re available in a variety of flavors, from hickory to mesquite, which can make a difference in how your food tastes. The design of these grills also allows consumers to slow-smoke food, making them grills and smokers all in one. When it comes to any cooking appliance, what you really want to know first is, “How will the food taste?” In recent years, pellet grills have become increasingly popular due to the rich, wood-grilled taste you get with each bite. The Z Grills Wood Pellet Grill & Smoker is both a wood-pellet grill and a smoker, and it allows you to grill, smoke, bake, roast, sear, braise, barbecue or chargrill your food. The George Foreman Indoor/Outdoor Electric Grill creates delicious-tasting food for what it is, but you still won’t get the same taste as you would on a charcoal or propane grill. When you’re ready to grill, you want plenty of space to squeeze all your items in. The Z Grills Wood Pellet Grill & Smoker offers a cooking surface area of 700 square inches. The Char-Broil Signature TRU-Infrared Gas Grill is fairly large, too, at 525 square inches of primary cooking space. You’ll get an additional 200 square inches of warming space on a separate rack. With the Weber Spirit II Outdoor Gas Grill’s 450 square inches you can grill up to 12 burgers at the same time. 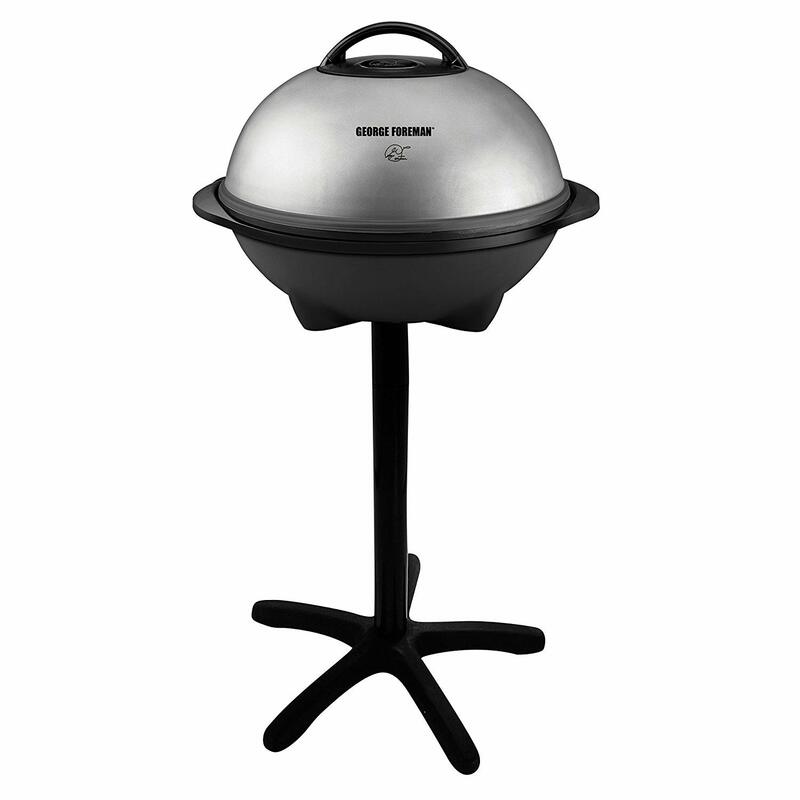 The George Foreman Indoor/Outdoor Electric Grill has a round cooking surface of 240 inches. If you’re looking for easy setup, the George Foreman Indoor/Outdoor Electric Grill is the best choice. It comes in three pieces that you can put together in a few minutes. The Z Grills Wood Pellet Grill & Smoker, Char-Broil Signature TRU-Infrared Gas Grill and Weber Spirit II Outdoor Gas Grill all require complex setup processes, so you’ll want to set aside some time at the outset. Once assembled, the Z Grills Wood Pellet Grill & Smoker and Weber Spirit II Outdoor Gas Grill are very easy to use. They both start immediately by simply pushing a button. Once started, the Weber Spirit II Outdoor Gas Grill heats up quickly so that you can start grilling. The George Foreman Indoor/Outdoor Electric Grill relies on a power cord, which is fairly short. Make sure you have somewhere to set it near a power outlet, whether you’re using it in your kitchen or on your back patio. If you’ve ever owned a grill, you probably know how hard it is to find one that emits consistent heat across every square inch. You shouldn’t have to move your items around from the warm area to the hot area to make sure everything cooks. The Char-Broil Signature TRU-Infrared Gas Grill builds in TRU Infrared technology to cook evenly across the entire surface. This is also the tech behind how it warms up faster and gets hotter than other grills. The Weber Spirit II Outdoor Gas Grill features 30,000 BTU burners designed to maintain consistent temperatures in any weather, but that BTU rating is slightly below the average for its category. The George Foreman Indoor/Outdoor Electric Grill runs on electricity, so it can offer even cooking, but it also gives you more control over how much heat you’re using. With some Z Grills Wood Pellet Grill & Smokers, you’ll get consistent temperatures unless the heat controller unit malfunctions. This is a known issue with these grills. If you want a grill you can take along with you, perhaps for a family reunion, you’ll want to stick with the George Foreman Indoor/Outdoor Electric Grill. Not only is it only 21 pounds, making it easy to transport, but you can also set it on any surface by just removing its stands. George Foreman’s grill line specializes in letting consumers achieve that grilled effect indoors, which keeps you grilling even during those long, cold months. To use the George Foreman Indoor/Outdoor Electric Grill inside, you’ll just need to remove the pedestal and take it inside. But one of the best things about this grill is that it can also be used outside. These grills are much larger than earlier versions of the George Foreman grill, so you’ll need to make sure you have enough counter space for it. Nobody wants to spend time scraping and cleaning the grill after use. The Z Grills Wood Pellet Grill & Smoker has a specially designed waste and oil collector to help keep the surface clean while you cook. The George Foreman Indoor/Outdoor Electric Grill’s cooking plate not only features non-stick coating, but it can also be removed to make cleanup easier. Unfortunately, it isn’t dishwasher safe, though. If you’re looking for an affordable grill, the George Foreman Indoor/Outdoor Electric Grill will be appealing, with a retail price below $100. But if you want a gas grill, the Weber Spirit II Outdoor Gas Grill is your next-best option, priced in the $300-$400 range. The Char-Broil Signature TRU-Infrared Gas Grill retails between $500 and $750, but the infrared technology may be worth it to some. Wood pellet grills and smokers, like the Z Grills Wood Pellet Grill & Smoker, will usually be priced well above other grills, due to the fact that they can give food that desirable smoky taste. The Z Grills Wood Pellet Grill & Smoker retails for more than $1,000. If you’re looking for sturdy construction, the Weber Spirit II Outdoor Gas Grill delivers. From porcelain-enameled, cast iron cooking grates to a stainless steel heat deflector, you’ll get a grill built to last. It also comes with Weber’s 10-year 100 percent guarantee. The Z Grills Wood Pellet Grill & Smoker, by contrast, only comes with a three-year manufacturer’s warranty.